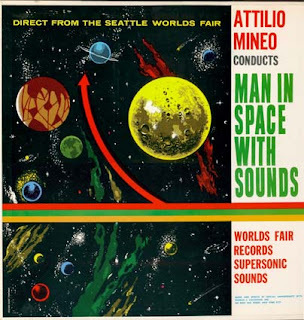 Composed in 1951, recorded in 1959 and released in 1962 for the Seattle-based World's Fair, Man In Space With Sounds is about as kitschy a record as one can find. A true product of it's time, Mineo here composes early electronic gems that bring to mind the romantic "Lost In Space" and "Space Mountain" era space music. It's a lot of fun, but unless you are putting on some sort of space themed event or party, the music doesn't have a ton of replay value. (Or maybe you're into old sci-fi comics or something). This is the Subliminal Sounds re-release so the first 12 tracks are the songs with spoken word introductions and the second 12 are the same songs without the vocals. "Attilio Mineo is one of those obscure artists who created music so far ahead of its time that we are still trying to catch up to it today. What we have today, in 1999, is music that is reminiscent of science fiction soundtracks from "Forbidden Planet" and "The Day the Earth Stood Still" to "Terminator 2" and "The Fifth Element." But the music also resembles some of the earliest tape-loop experiments by people like Stockhausen, where traditional musical elements were combined with samples and sound effects. Mineo manages to blends orchestral scores with sound effects so that there is almost no distinction between them. The strings and horns are as "alien" as the alarm sounds and the theromyne wails. What really makes this music contemporary with 1999, however, is the thing that probably killed its commercial appeal in the 1960s--the narrator. At the start of each track, a narrator offers a brief comment, designed to guide the visitor through the fair. From a modern perspective, however, the narrator merely adds another weird element to music that is already weirder than most anything I've ever heard. Again, this is a gem: a found piece of electronic art that deserves recognition."